Our much anticipated September summer fest Bestival returns once again to the Isle of Wight’s picturesque Robin Hill Country Park on the 5, 6, 7th September 2008, for another rip-roaring feast of merriment, mirth and musical treats. Expect frolicking aplenty as we dress up to boogie on down for our 5th mind-blowing spectacular. Exhibiting more than a touch of his famed good taste, Bestival curator Rob da Bank, has excelled himself once again with a truly stratospheric line-up of musical legends and super-hot scene setters. The undisputed kings of ethereal dream-pop, My Bloody Valentine, will be headlining the main stage on the Friday night for their only English festival appearance this year. With their famed incandescent wall-of-sound and tremulous grooves creating a uniquely powerful live experience, My Bloody Valentine’s return after more than 15 years is highly anticipated and their headline set is sure to mark yet another magical moment in Bestival’s burgeoning folklore. As if that alone wasn’t enough to whet your appetite for this year’s festival feast, electronic enigma Aphex Twin will be unleashing his West Country wizardry for an English festival exclusive headlining the Big Top on Saturday night. Whether he’s bathing the crowd in the analogue bubbles of his pioneering acid techno, or selecting his revered ambient works, one thing is for sure, you can always expect the unexpected from Mr. Richard D James. We are also massively thrilled that living legend George Clinton & Funkadelic / Parliament will be landing their mothership at Robin Hill to make their Bestival debut! One of music’s true originals, George will be laying down some booty shaking psychedelic p-funk to bring one festival under a groove. 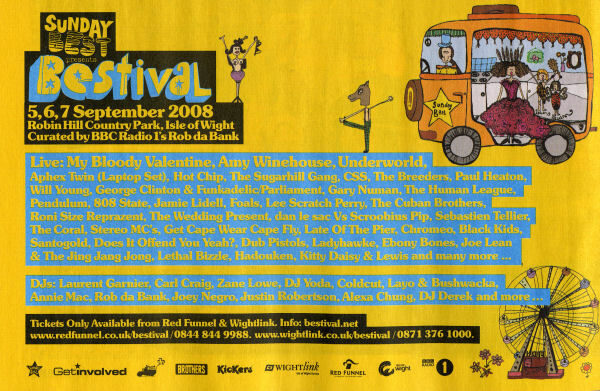 And it doesn’t stop there, other acts confirmed so far for Bestival 2008 include Brazilian septet CSS, lead by the irrepressible Lovefoxxx, who are certain to rock the Bestival faithful, headlining the Big Top on Friday, with their ever infectious blend of indie rock and electro. Original electro-pop pioneers The Human League will be playing their classic Dare! album in its entirety in the Big Top before treating the crowd to a full on hits set on the main stage on Saturday and the nostalgia factor will be well and truly ramped-up a main stage set from synth-punk godfather Gary Numan. The cutting edge is catered for by the DIY stylings of Ebony Bones, Foals, dan le sac Vs Scroobius Pip, Sportsday Megaphone, Christopher D Ashley and the arcade assault of Crystal Castles. Also making appearances will be the live drum ‘n’ bass juggernaut of Pendulum, plus jangling indie legends The Wedding Present, Kim Deal’s tour-de-force The Breeders, the soul-tronica of Jamie Lidell, a live set from Acid House pioneers 808 State, Worldbeat marvel Baaba Mal, the first lord of Reggae Lee 'Scratch' Perry, Gallic love machine Sebastien Tellier, a right old cockney knees-up from Chas & Dave and Transglobal Underground’s ethno-techno. And, of course, the joy of Bestival will be spread by our dear Main stage hosts The Cuban Brothers, as the mighty Miguel and his merry men keep the party spirit alive and kicking all weekend. There will also be the very welcome return of the BBC Introducing… stage which will be showcasing a host of up-and-coming bands. Including: Joe Lean And The Jing Jang Jong, The Duke Spirit, Teenagers, Tawiah, f*** Buttons, Cage The Elephant, Ladyhawke, Metronomy, Ox Eagle Lion Man, These New Puritans, Lets Wrestle, Little Dragon, Imperial Leisure, Gideon Conn, Zombie Zombie, George Pringle, Subgiant, The Restaurant, Vessels, The Ghost, Peter Von Poehl, St Vincent, Fleet Foxes and Six Nation State. Bestival wouldn’t be complete without some of our favourite acts from previous years, including the incomparable DJ Yoda, the retro rock n roll of Kitty Daisy & Lewis, BBC Radio 1's lovely Annie Mac, the sublime Grand National, the kiddy disco-punk of Kid Carpet, the legend that is DJ Derek, chief Dexy Kevin Rowlands and the Isle of Wight’s own Bastila. But it’s not just the music that makes Bestival special – we’ll be opening a Pandora’s box of tantalizing treats including our Bollywood cocktail bar, Jestival comedy and spoken word tent, Farmers market, secret stages and Kids Area. Bestival isn’t just a stunning music festival, it’s a 3-day wonderland of outlandish adventure and unparalleled escapism. Unlike any other festival experience around, the eye-catching adornments and magical mood throughout the fields of fun offer up endless pleasures, where fancy dress is the norm and tea and cake is always a good idea. All Under 18s must be accompanied by a Ticket holding parent or guardian over the age of 21. And one ticket holding parent or guardian can only accompany up to 4 people under the age of 18. Blimey, I'm away for a day and it's all 'go' here What a line-up! As usual, please wait for full confirmation by 808state.com and also for the exact day on which 808 will be performing. Unconfirmed as yet. Date could be Sat 6 September. This now seems to be confirmed. It's not quite clear if & when we'll receive a fixed day as apparently Bestival orders can change sometimes even a fortnight leading up to the event, hopefully we can get 808 tied down to a day. Update: 808 @ Bestival is confirmed, but as mentioned earlier, no exact date known at this point. Blimey! Who of you are going to this? still up for gatecrasher, was gonna get tickets for bestival at same time! knowing my luck gatecrasher will be sold out when i DO eventually get a ticket! just gotta get my months rent, deposit paid first!